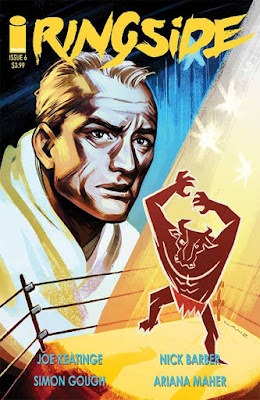 NEGROMANCER 2.0: Image Comics Announces a New Story Arc for "Ringside"
Image Comics Announces a New Story Arc for "Ringside"
Writer Joe Keatinge (SHUTTER) and debut artist Nick Barber will launch the highly anticipated second act of their ongoing noir drama, RINGSIDE, this August 2016. Previously in RINGSIDE, fans explored the crossroads of art, industry, and identity within the world of professional wrestling through a literary lens and the rotating perspectives of the wrestlers themselves, the creatives they work with, the suits in charge, and the fans cheering them all on. Comic Bastards praised the series as having "a quiet poetry to the whole thing, like a Steinbeck novel, with frog splashes." "Ringside's first act is entitled 'Kayfabe,' after the wrestling term meaning the scripted 'reality' of what happens in the ring and dealt, in part, with the different realities we build around ourselves," said Keatinge. "The second is entitled 'Work,' which goes into the wrestling terminology meaning anything which is planned to happen, 'working a crowd,' but quickly delves into how hard it is to maintain false narratives and, in turn, the devastating consequences of their hidden truths." RINGSIDE #6 (Diamond code: MAY160613) hits stores Wednesday, August 10th, 2016. Final order cutoff deadline for retailers is Monday, July 18th, 2016.